For some time, Sudbury Chess Club has met at the Quay Theatre for club nights, but until now has used the local church hall for matches. The problem with the theatre was that it was very noisy, situated adjacent to the bar, and therefore unsuitable for match play. By moving to Mondays for matches, an upstairs room at the theatre has become available. 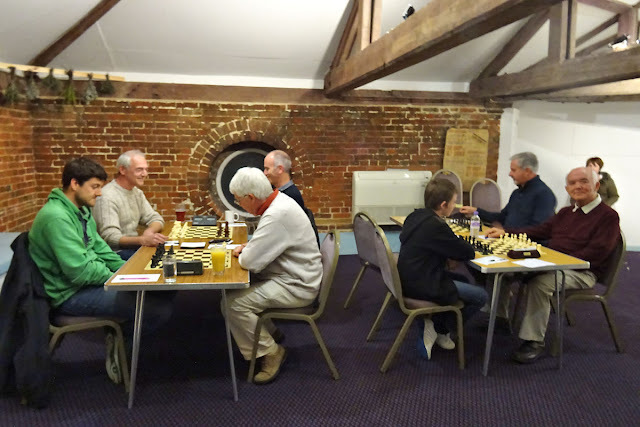 The Geoff Kisby Room (named after the person who opened the Quay Theatre in 1981) is much quieter and is ideal for a four-board match. The venue was in use this evening, when Sudbury entertained Stowmarket in Division 2. The result was a 2 - 2 draw. In the photo are (left to right) Stephen Lewis, Richard Lamont, Harold Thomas, Rob Sanders, Alex Sheerin, John Kent, Jakob Tulic. Hiding in the background is Alex's Mum Jane.